All of the things I just talked about are things you have seen before, like seeds, you know about this, right? 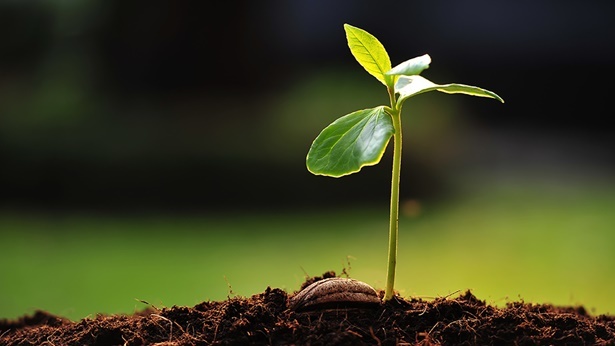 A seed growing into a tree might not be a process you see in detail, but you know that it is a fact, right? (Yes.) You know about the earth and the sunlight, right? The image of songbirds perching in a tree is a thing all people have seen, right? (Yes.) And people cooling off in the shade of a tree, you’ve all seen that, right? (We have seen that.) So what feeling do you get when you see all these examples in one image? (Harmony.) Do all the examples that exist in this image come from God? (Yes.) As they come from God, God knows the value and significance of these several examples existing together on the earth. When God created all things, He had a plan for each item, and each thing He created shows His intentions and He imbues life in them. He created the living environment for mankind, which is discussed in the story we just heard. It discussed the interdependence the seed and the earth have; the earth nourishes the seed and the seed is bound to the earth. The relationship between these two was predetermined by God from the very beginning, right? (Yes.) The tree, the sunlight, the songbirds, and man in this image, are they an example of the living environment that God created for mankind? (Yes.) First, can the tree leave the earth? (No.) Can the tree be without sunlight? (No.) Then what was God’s purpose for creating the tree, can we say that it was just for the earth? Can we say that it was just for the songbirds? Can we say that it was just for the people? (No.) What is the relationship between them? The relationship between them is one of interdependence wherein they cannot be separated. The earth, the tree, the sunlight, the songbirds, and the people rely on one another for existence and they nurture one another. 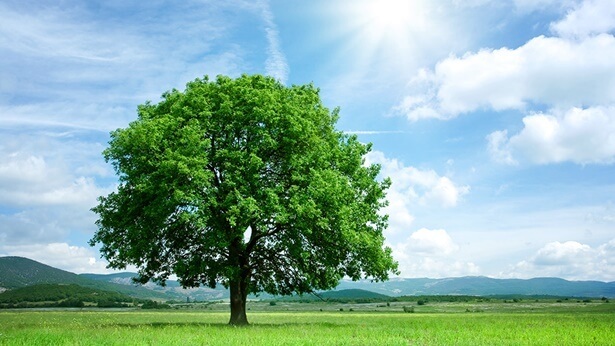 The tree protects the earth while the earth nurtures the tree; the sunlight provides for the tree, while the tree creates fresh air from the sunlight and helps soothe the earth from the heat of the sunlight. Who benefits from this in the end? Mankind benefits from this, right? (Yes.) And this is one of the principles behind why God made the living environment for mankind and one of the primary purposes for it. Even though this is a simple picture, we can see God’s wisdom and His intentions. Mankind cannot live without the earth, or without trees, or without the songbirds and sunlight, right? Even though it was a story, it is a microcosm of God’s creation of the universe and His bestowal of the living environment upon man. God created the heavens and earth and all things for mankind and He created the living environment as well. First, the main point we discussed in the story is the interconnected relationships and interdependence of all things. Under this principle, the living environment for mankind is protected, it survives and continues; because of the existence of this living environment, mankind can thrive and reproduce. We saw the tree, the earth, the sunlight, songbirds, and people in the scene. Was God there as well? People may not see it, right? On the surface it may seem like God was not there, but people can see the rules of the interconnected relationships between the things in the scene; it is through these rules that people can see that God exists and that He is the Ruler. Right? God uses these principles and rules to preserve the life and existence of all things. It is in this way that He provides for all things and He provides for mankind. Does this story have any connection to the theme we just discussed? (Yes.) On the surface it seems like there isn’t one, but in reality the rules God has made as the Creator and His dominion over all things are strongly connected with His being the source of life for all things and they are inextricably linked. Right? (Yes.) You’ve learned a little something, right? God is the Master of the rules that control the universe, He controls the rules that govern the survival of all things, and He also controls the universe and all things such that they can live together; He makes it so they do not go extinct or disappear so that mankind may continue to exist, man can live in such an environment through God’s leadership. These rules that govern all things are under the dominion of God, however, mankind cannot intervene and cannot change them; only God Himself knows these rules and only He Himself manages them. When will the trees sprout, when will it rain, how much water and how many nutrients will the earth give the plants, in what season will the leaves fall, in what season will the trees bear fruit, how much energy will the sunlight give the trees, what will the trees exhale from the energy they get from the sunlight—these are all things that God had already arranged when He created the universe and they are laws that cannot be broken by man. The things created by God—whether they are living or appear to be non-living by people—are all in God’s hands and under His dominion. No man can change or break this rule. That is to say, when God created all things He formulated how they should be. The tree could not set down roots, sprout, and grow without the earth. What would the earth be like if it had no trees? It would dry out. Isn’t this right? (Yes.) Also, the tree is the home of the songbirds, it is a place where they take shelter from the wind. Would it be OK if the tree went without sunlight? (It would not be OK.) If the tree only had the earth that would not work. All of this is for mankind and for mankind’s survival. Man receives fresh air from the tree, and lives upon the earth protected by it. Man cannot live without sunlight, man cannot live without all the various living beings. Even though the relationships between these things are complex, people must clearly understand that God created the rules that govern all things so that they may exist in an interconnected and interdependent way; every single thing He created has value and significance. If God created something without significance, God would let it disappear. Understand? (Yes.) This is one of the methods He used in the provision of all things. What does “provide for” refer to in this story? Does God go out and water the tree every day? Does the tree need God’s help to breathe? (No.) “Provide for” in this instance refers to God’s management of all things after creation; all He needed were rules to keep things running smoothly. The tree grew all by itself by being planted in the earth. The conditions for it to grow were all created by God. He made the sunlight, the water, the soil, the air, and the surrounding environment, the wind, frost, snow, and rain, and the four seasons; these are the conditions that the tree needs in order to grow, these are things that God prepared. So, is God the source of this living environment? (Yes.) Does God have to go out every day and count each leaf on the trees? There’s no need, right? God also doesn’t have to help the tree breathe. God also doesn’t have to wake up the sunlight every day by saying, “It’s time to shine on the trees now.” He doesn’t have to do that. The sunlight shines down on its own as prescribed by the rules, it shines on the tree and the tree soaks it in. This is how things live within the rules. Perhaps this is a phenomenon you cannot explain clearly, but it is a fact everyone has seen and has accepted. All you need to do is recognize that the rules for the existence of all things come from God and know that their growth and survival are under God’s dominion. This proves that God is the source for all life. Is a metaphor used in this story, as men would call it? (No.) Is it anthropomorphic? (No.) What I talked about is truth. Everything that is alive, everything that exists is under the dominion of God. Everything was given life after God created it; it is life given from God and it follows the laws and path He created for it. This needs not be altered by man, and needs no help from man; this is how God provides for all things. You understand, right? Do you think it is necessary for people to recognize this? (Yes.) So, does this story have anything to do with biology? Does it have any relation to any field of knowledge or science? (No.) We are not discussing biology here and we certainly are not doing any biological research. What is the main point that we are talking about here? (That God is the source for all life.) What do you see among all things of creation? Have you seen trees? Have you seen the earth? (Yes.) You have seen the sunlight, right? Have you seen birds resting in the trees? (We have.) Is mankind happy to live in such an environment? (He is happy.) God uses all things—the things He created to maintain mankind’s home for survival and protect mankind’s home, and this is how He provides for man and provides for all things.